I have been reading a lot off these things that says" start here,begginers tips etc) Witch non help me. Just got my al85 with diy attie(single coil build). Everything is just explained to far for me… Habe no idea what people are saying and they begginers…wow… What am i?? Can i just buy any 3 flavours and mix 3% each? I want to point out that if you don’t like to read, or its still to advanced and all you get is being o erwhelmed, hit up YouTube. Search for “Fresh from the Kitchen” by TVC I wish I had followed that show as I started because I would have avoided the purchase of crappy flavors and wouldn’t have mixed A with B and so on. Its an amazing show but just like DIY itself you will need some time, patience and willingness to learn. Fresh together with Brian doing an amazing job explaining to beginners how to diy. From there it will be easier for you to understand other written articles or forum discussion. Important tho, start with episode 1 and go from there. Gl. I have been reading a lot off these things that says" start here,begginers tips etc) Witch non help me. One shot flavors are starting to gain momentum for those interested in mixing their own and want to start out simple. These Flavors are pre mixed flavors that are only designed to be used on their own and mixed with a base of Propylene Glycol, Vegetable Glycerine and Nicotine (if desired). It’s kind of difficult to start out DIY’g when you are still trying out new equipment and establishing your taste favorites. You could save some money/study by mixing one shots (OS/Flavor Blends). I found one shot mixing to be close to the flavor advertised on the bottle and can provide some adjustment of the strength (percentage) of flavor. OS Mixing also is a good introductory to DIY. One Shots and Blends are simply added per directions of the seller to a Mixing Base, Shake and Vape! http://gremlindiy.com/flavors/gremlin/ — Known as “Gremlin DIY” = one shot? Thanks for the reply. I have read “Beginner’s Guide to Using The ELR Recipe Calculator” and a few other,still it doesn’t tell me what percentage to use in the calculator. I see some guys use 0.2% and others 2% … Will try and whats the videos. Will go read the things you posted i haven’t read as well. Appreciate the help a lot. Usually when experienced mixers buy flavors, they read up on them to get a feel for what to expect. Unless you have unlimited resources, you have to figure out why to buy this brand over that brand, and that’s where flavor notes/reviews from others come in handy. Once you’ve done this, you already have a feel for what it is you get, what the flavor is used for, how strong or weak the flavor is, whether it’s a supporting flavor in recipes or a main ingredient (or both). 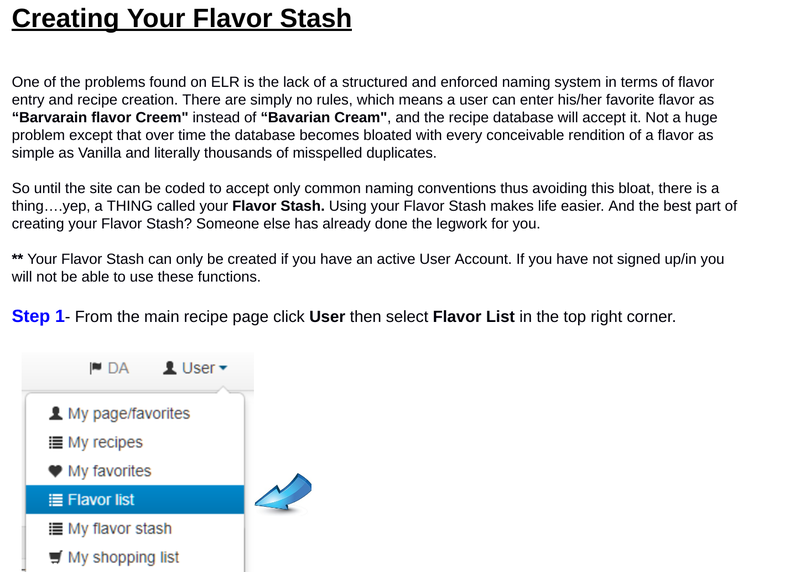 Then when you’ve ordered the flavors and get them delivered, the first things you should do is a) add them to your flavor stash and b) make some test samples with different % (based on the company’s suggestions and flavor notes you’ve read). 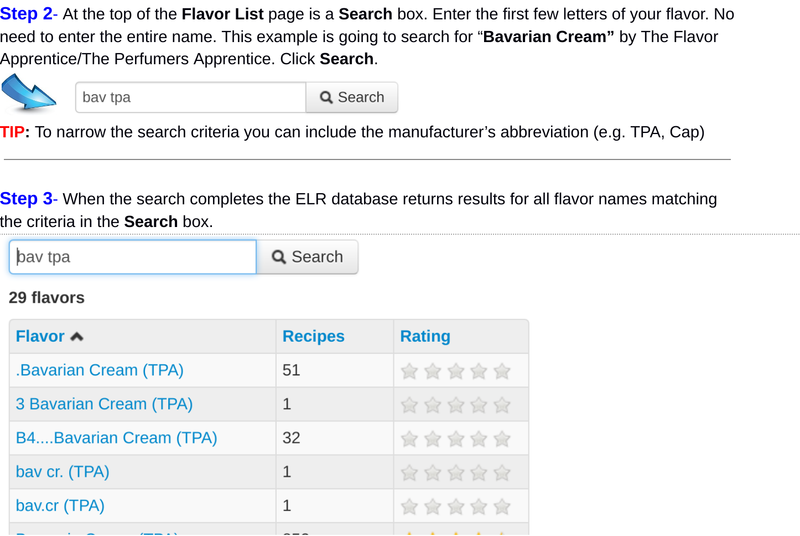 Once you’ve tested them, you take some notes and you’ll be able to figure out at what % to used those flavors. An additional advantage of this is that when you see a recipe from someone else, you’ll already be able to judge whether it’s a recipe you might be interested in or whether the flavor is used inappropriately (for your taste buds). As long as you don’t have a grasp of what your flavors are like, the recipes that you’ll make will be hit and miss, because taste is very subjective. Some may like a flavor at high % in a recipe while that really doesn’t work for you. Flavors used at very low % (e.g. your 0.2%), may be extremely potent flavors, or just there to support another flavor in the recipe. E.g. a touch of dragonfruit may be used to make a strawberry flavor more rounded without giving the recipe any hint of the dragonfruit itself. In other recipes you may see that same dragonfruit used as a main flavor at a much higher %. 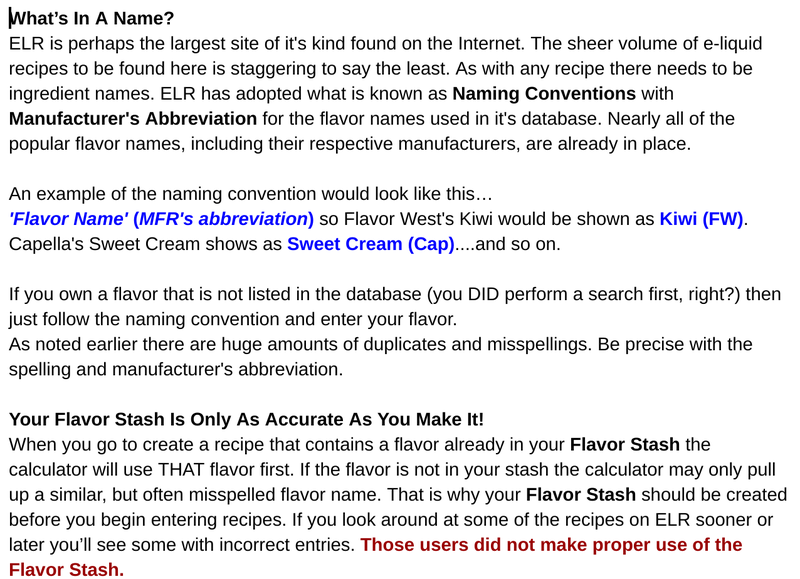 You really have to read about and test your flavors a lot to have a good understanding of how to use them. With so many different flavor companies and even within a brand you may find different flavors of the same (e.g. tpa strawberry, tpa strawberry ripe, etc), it just takes a long time to really get the hang of everything. To make things even more complicated… it’s not just what a flavor tastes like that is important. Also the composition of a flavor is important. Some flavors may contain Ethyl Maltol for example, a substance used to sweeten flavors, but it also has the effect of muting flavors and taking the edge of sharp notes in a recipe. So combining a few flavors that taste great separately, may end up not being so good when you add them together. This is why people keep saying to read a lot, and when you think you’re done, read some more. Don’t let that scare or stop you though. There are a lot of people who don’t even care about these things. They just browse existing recipes, get the flavors for those recipes and make them just like that without fiddling with it or creating their own recipes. It’s all up to you what you want to do with it, that’s the great thing about DIY. Going about it this way is ideal when you start mixing your own e-liquids. The knowledge about your flavors will build up over time. 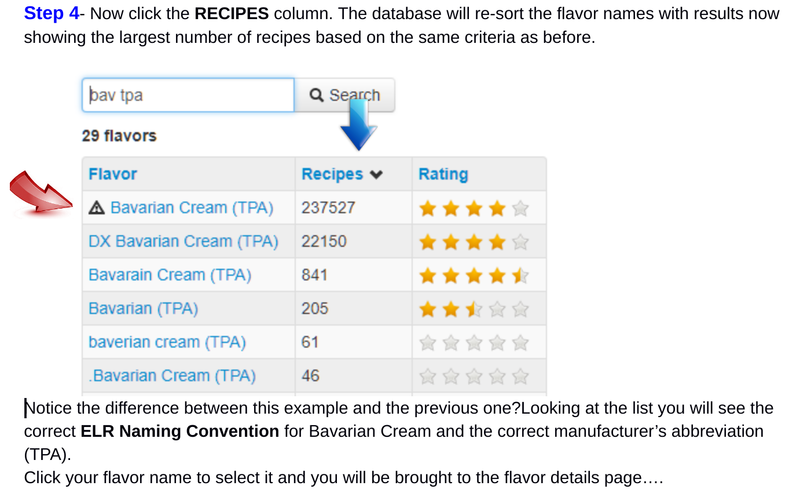 There is usually a median percentage used as well as helpful notes on flavors you have questions about. There is a lot of different tabs on the recipe side that were very helpful for me when i started! Glad you are here! Thanks everyone. Wil keep on with it. Would love to make something that other people would like to vape. Just my two cents as a very new DIY’er. Less is definitely more. I kept thinking the problem with my mixes was under-flavouring. It was completely the opposite, especially in recipes with multiple flavours. Some of the best mixes I’ve made were way down at like 7-10% total flavour concentrate. About 4-6% of the ‘star’ flavour(s) in total and a handful of some very small accents to compliment. Yeah, I’d recommend just building up in increments until you get there. You’ll hit the sweet spot eventually!